This is session three of a four part series. See session one for additional information. This is the fourth session in a four session series. See session one for additional information. Spend this final weekend at Carson-Newman University studying illuminated manuscripts from across the centuries, employing many of the materials and techniques presented in this course. Ever since men began to write in books, there has been the urge to decorate the pages in some way. 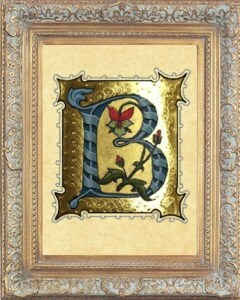 These decorations have changed over the ages depending on the letter styles used and the purpose for the illumination. They have become more elaborate over time, taking up a whole page at times. The word illuminate derives from the initial reason — to illumine or light up the word of God. Today, of course, we use these methods for many different purposes. Capital letters are important — they start every sentence and verse. They accentuate the titles and emphasize important texts. The capitals that accompany most calligraphic styles are based on the basic Roman proportions. 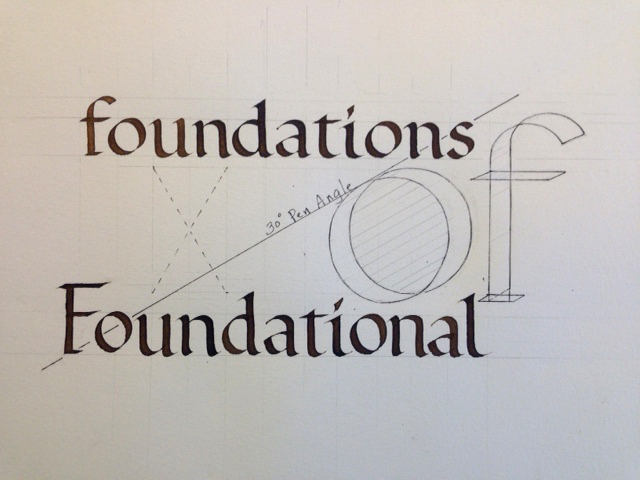 Understanding these proportions gives the calligrapher the ability to then manipulate the letterforms to fit with any of the various letter styles, such as Bookhand, Foundational, Carolingian, Italic and are the basis for Versals. 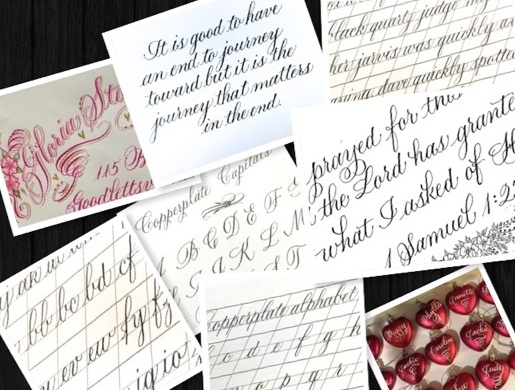 Participants will explore the basic Roman form, then using various methods, exercises and mediums, learn to create Capitals that will enhance any piece of calligraphic art. 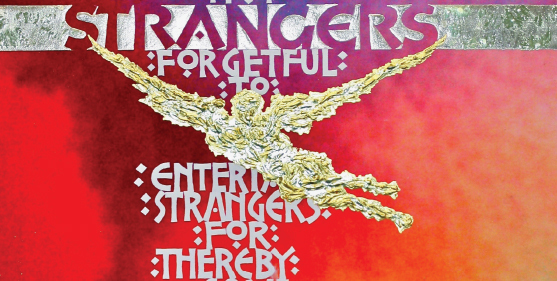 There are innumerable ways to add interest and emphasis to your lettering — whether in a rendition that reflects the past or in a modern interpretation. There are so many options that it can get confusing — from formal to informal. Though Lombardic Capitals are used often for the process, these techniques can be applied to almost any letter style. In this class participants will be introduced to some of the basic steps they can take to create a beautiful illuminated letter. We will proceed step by step through the processes to build up the form adding shading and highlights and line accents. We will discuss materials and painting techniques. Participants will be introduced to several ways to add gold or metallic accents to their work — using paint, powdered metals, and gilding techniques. In addition, we will experiment with some methods to add a modern twist to your letters. 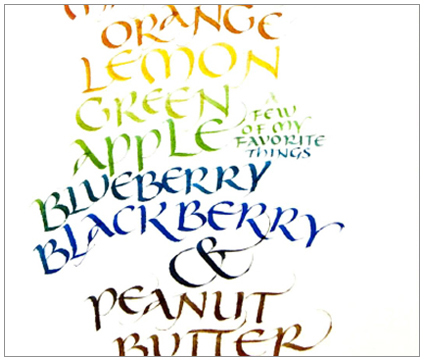 The Victorian Pen introduces pen drawn flourishes that have been influenced by the colours and styles of the Victorian era. 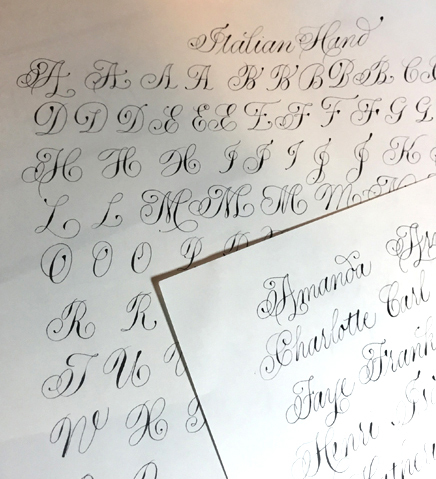 Many of the historic offhand flourishing designs start out as pencil sketches before rendering the designs in ink. The Victorian Pen workshop introduces pencil techniques for the terrified! 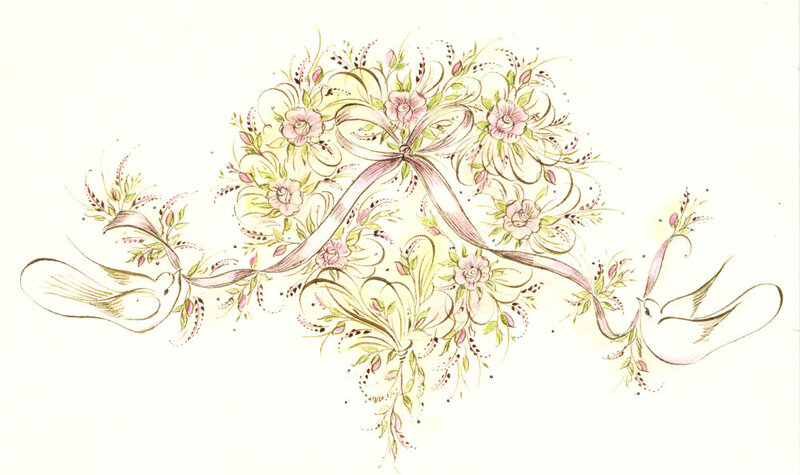 Even if you think you cannot draw, this class will help you add simple floral designs, acanthus patterns and ornamental scroll work your offhand flourishing. The use of the pencil allows preplanning and corrections which are not possible with true offhand flourishing. We start simply with corner ornaments and expand to more intricate designs. These decorative ornaments can be gilded with 23K gold leaf and painted with watercolour or tinted gently with coloured pencil. 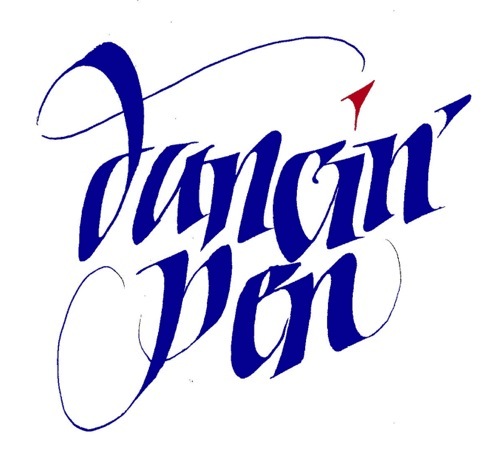 This class assumes some knowledge of the pointed pen. Enjoy a day of creating watercolor botanicals inspired by Chinese painting. Learn about the materials, Chinese painting and the wide variety of strokes that you can achieve with one brush. Miranda will teach you how to create multiple flowers and leaves to compliment your lettering, envelopes or to stand alone. This is session two of a four part series. See session one for additional information. Textura is called by many names...Gothic, Blackletter, Old English but there are slight differences. For me, Textura is a simpler form and you can create more difficult forms from that. We will begin with the basics and before the weekend is over I will add a little Fractur to go along with it. The capital letters are especially beautiful. This class will not involve a lot of supplies since we will be using graph paper (to help you with straight lines) and the Parallel Pens so you won’t have to wait for ink to dry. They also make great hairlines!! There will be more about supplies when you sign up. This is a great class for beginners so you don’t have to deal with slant. I hope to see you there! Photo courtesy of Sheryl Bracey. This is a four session course that meets March 2-3, April 6-7, May 4-5 and May 31 - June 1. Participants should plan to attend all four sessions. The greatest work of art in western calligraphy and illumination in the last 500 years is The Saint John’s Bible. It is created with materials that reach back millennia: calfskin vellum, quills, stick inks, dry pigments, gilding, and more. The designs, though grounded in tradition, always have a contemporary flair. The intention of this extended studies course is to be immersed in these materials and techniques in order to produce a finished work, broadside or book, integrating these materials and designs. Metal nibs: broad edge, pointed, ruling pen, ball pointed pen: adapting them with honing (several), reservoirs, distempering, snipping. Participants must have a working knowledge of Italic lettering. The final weekend at Carson-Newman University studying illuminated manuscripts from across the centuries, employing many of the materials and techniques presented in this course. Starting with basic drawing principles like line quality and shading, we will experiment with each tool to discover the marks it can produce. We will then move on to drawing letters and designing word groups, both formal and casual. The monochromatic drawn letterform forces us to slow down and relate more organically to the forms we are creating. You will find drawing letterforms with care and thoughtfulness to be so helpful in improving your design and lettering skills and in allowing for more refined and subtle attention to detail. Further time will let us explore how to integrate our letters with their backgrounds into designs that will grab our viewer’s eye. Finally I’ll show you some of the tricks I’ve learned to save time and ensure success when working with this versatile medium. Photo courtesy of Amity Parks. Rose gold, lemon gold, yellow gold, white gold, raised gilding, flat gilding, tooling, gesso size, acrylic size, natural size, synthetic size, powdered gold, shell gold, golden graiselle… so much to learn and so little time. In this workshop, you will learn what each technique is by hands on gilding. We will gild on vellum and hot press watercolor paper. We will start with ancient techniques and work our way up to modern, including flash gilding and mica powder. Rather than having students purchase expensive supplies and equipment, a $25 supply fee is charged and ALL the gold, sizes, and papers will be provided for you, including the vellum. I will have a variety of burnishers, ruling pens, and quills for you to try. We will take the mystery out of all that glitters. Photo courtesy of Harvest Crittenden. The split nib is used to create outline, sometimes called open, alphabets. A split nib is a broad edged pen and may be used with virtually any broad pen alphabet. The results can be spectacular! Your sense of letter design will go wild!! You will also greatly enhance your understanding of the broad edged pen. In Calligraphy with the Split Nib, we will work with a number of alphabets including Foundational, blackletter, italic, and other alphabets. Fun will be the order of the day! Photo courtesy of Ann Cobb. So, you think you can’t paint? 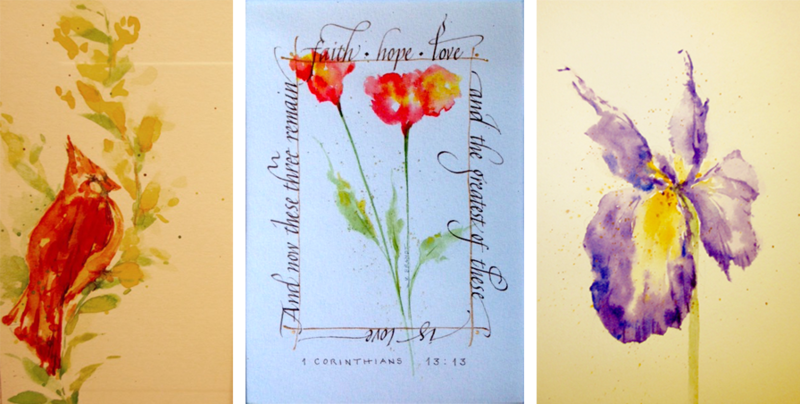 Enjoy a weekend learning to create easy watercolor botanicals, simple objects and washes to compliment your calligraphy or to stand alone. This class will include some sketching techniques. Previous painting experience is not required. If you wish to be placed on a waiting list, please email Ann Cobb, Workshop Chair. Neuland was the brain-child of Rudolf Koch but it has changed over the years and there are not any rules for this alphabet! (I like that!) It does not have an established history. We will be taking the morning to learn how to do the alphabet, and the afternoon to bring some color and life to it. I will also show you some fun and different ways to use it. It will be easier for you to bring parallel pens for this class...especially the larger ones...but you can use your broad edge pens or markers. You will be using some colored pencils as well. I will give you a detailed list later but it is not very large. This will be a fast-paced but fun class...not stressful at all! I hope to see you there! !